Smith, chairman of Save The Bays, made his comments during a near standing room only crowd at the October 31 meeting of the Rotary Club of East Nassau. Among the guests was long-time Rotarian Sir Durward Knowles, the Bahamas’ first Olympic gold medalist, who was celebrating his 97th birthday and reminisced about playing rugby with Smith’s father. But those were far more innocent days, the two local heroes from different generations agreed, and now Smith worries that The Bahamas is headed in the wrong direction. “The biggest problem we face in The Bahamas is that we worship the people in power,” said the legendary litigator whose court appearances draw law students and garner media attention. Blind worship of leaders, he said, leads to acceptance of practices that would not be tolerated elsewhere. “If I want to invest in a residence or a business in Florida, I don’t go to Tallahassee (the capital) and walk around with the governor,” he said. But in The Bahamas, the foreign investor who wants to build a resort or a development has to go through the Office of the Prime Minister, pay homage and discuss all the proposals in private and seek a Heads of Agreement – all cloaked in secrecy, barring those who might be affected by the proposed development from even commenting on it. The practice, he said, also adds to the Bahamian distrust of foreigners. “Bahamians don’t have to go to the Office of the Prime Minister. We are able to conduct business without having to go to the Office of the Prime Minister. But the foreigner does.” And that, he believes, leads to a suspicion of favouritism. “We rely on foreign investment and we need foreign capital,” Smith said. “But we believe that what is white and what is foreign is evil.” And that, he thinks, is due to the perception that those secret meetings lead to secret deals with the foreigner emerging with more benefits than locals, including quickly being granted Crown Land for bargain prices while 3,500 applications for Crown Land grants by Bahamians await review, some on file for years. “The way we are conducting business now is a recipe for economic disaster, for corruption and for dictatorship,” he charged. “The government needs to remember they are employees and we have a right to know what they are doing. Every deal that the government enters into should be out on the table for everyone to see. The proposals should be presented, debated, every part – property tax exemption, Customs duties, Crown Land grants. We are completely ignorant about the business of government and the business of government should be in the hands of businesspeople. Urging passage of Freedom of Information act is one of the major tenets of Save The Bays, along with an end to unregulated development, accountability for oil pollution and passage of an environmental protection act. The fast-growing environmental advocacy group has set records in social media with more than 17,100 Facebook friends and over 6,000 signatures on a petition on www.savethebays.bs supporting its principles. 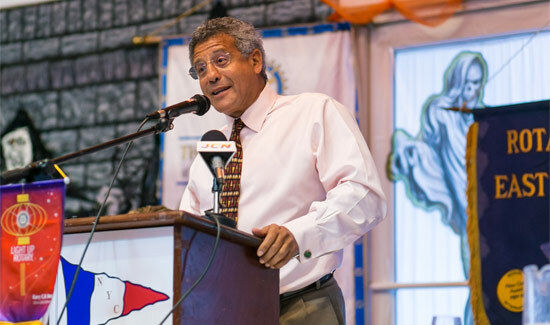 Noted environmental and human rights attorney Fred Smith, QC, chairman of Save The Bays, addresses the Rotary Club of East Nassau, urging an end to secrecy, patronage, worship of leaders and a more open and transparent investment policy.